So far, viewers have selected "Larry King Live's" coverage of 9/11 as their top moment of the show's 25 years. Right now on CNN.com, viewers can vote for the top 5 moments in "Larry King Live" history, as part of the show's 25th anniversary celebration. Here, Larry King admits he's surprised by the way the voting is going so far. Later in the week Larry will offer his personal top 5 moments. (CNN) -- I never thought that this show would last 25 years -- I didn't even know it would be a success. I took it on kind of a dare. There was a three-year deal with Ted Turner, but I had an option to get out after a year. I never thought I'd be on worldwide, or we'd have the kind of impact we've had on elections and cable in general. Now, we're the longest-running show ever on the same network, at the same time, with the same host. And now you guys are picking the top moments in our shows history. Here's what I think of the results so far, with a week to go in the voting. 1. 9/11 -- We were part of that whole story. The moment focuses on the week I was in New York after 9/11, and I think that was some of the best broadcasting we've ever done. We had in-depth interviews, we were at the site. We had principle people. We covered it as well as I think any show ever covered anything. 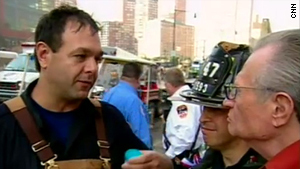 My strongest memory from that week was when the fire commissioner of New York took me through the rubble. I interviewed firemen and policemen who were there at the aftermath. I remember the drive down, and the barricades, and wearing the mask. Then going to the burn center -- the same hospital where I had my heart surgery. That was a momentous thing; it's almost impossible to describe what that was like. Then the night we aired that, Mayor Rudy Giuliani was my guest and that was an amazing interview. 2. Obama inauguration -- It surprises me a little that it's number two right now. We had good shows, but everybody covered it. I would have thought Sinatra and the Beatles would have been up higher. The inaugural event was tremendous -- I think we did a good series of shows. We were on top of the story with good guests, but it surprises me it's up there. Maybe that's because it's one of the most recent. 3. Death of Michael Jackson -- Same thing here as with the Obama inauguration. Happened recently, powerful impact ... The figure he was, the shock -- for it to happen at his age. I think all that has bearing. But all of the top three were tremendous news stories. 4. Simpson Car Chase -- I thought this would be higher than it is, because I was in a position of describing an event as it was happening. I'm 2,500 miles away in our Washington studios, talking about a city I wasn't familiar with. I'd gone to L.A., but I didn't know those highways then like I do now. I had the map and was continuously broadcasting for three hours. I'm not surprised at that at all. I thought it would be higher than number four. 5. Marlon Brando -- I thought this would be number one, but the problem with this world today is the Brandos, the Sinatras ... as great figures as they were, it fades. It's yesterday. It's sad in a way, but it's the lay of the land. Same with the three Middle East leaders. But the problem is the situation hasn't improved, all three of those guys are gone. It's yesterday. So in retrospect, I guess this doesn't surprise me.